You’ve probably been told to eat your greens since you were little, right? We’re all supposed to eat our greens, but it isn’t always easy. Getting access to fresh, leafy greens isn’t possible for everyone and they can be pricey depending on where you live and the time of year. And of course there is the issue of taste. Most of us have a hard time choking down greens, many of which are bitter-tasting. The health benefits, though, are powerful. If you aren’t getting your greens every day, consider using smoothies and a few short cuts to eat more of these wonderful superfoods. Lettuce. The standard American salad lettuce, iceberg, doesn’t have much nutritional value. It’s mostly water. But, if you branch out into darker lettuce leaves, like romaine, red lettuce, butter lettuce, arugula, and other salad greens, you will get a host of nutrients including vitamins A, C, and K as well as folic acid. Kale. This trendy green has been showing up in salads, cooked greens, and even as baked chips. Kale is a nutritional powerhouse and includes a number of vitamins, folic acid, potassium, and calcium. You can eat baby kale raw in salads and steam or stir fry the mature leaves. Chard. The colorful stems of rainbow shard are a fun addition to most dishes, but the leaves are where you get your vitamins and a healthy dose of dietary iron. Collard/mustard/turnip greens. These three leafy greens are staples of the southern dinner plate and have very strong flavors ranging from bitter to peppery. They are low in calories, but high in vitamins, calcium, and fiber. Spinach. Spinach leaves are versatile greens. You can eat them raw in salads or blended into smoothies without worrying about getting a flavor that is too intense or bitter. You can also wilt baby spinach leaves or stir fry the mature leaves. Spinach is rich in vitamins A and C, iron, folic acid, and fiber. Cabbage. Green cabbage is not one of your dark greens, but it is a healthful vegetable green with antioxidants, vitamin C and few calories. Broccoli. Related to cabbage, broccoli is a cruciferous vegetable that contains compounds called glucosinolates, known to inhibit the growth of cancer. It is also rich in magnesium, vitamin C and other nutrients. Grasses. Cereal grasses are the early shoots of grains like wheat, barley, oats and alfalfa. As grasses they are not grains yet and they do not contain gluten. They do have plenty of vitamin C and B12, calcium, iron, and protein. Herbs. Green herbs, like parsley, basil, peppermint, oregano, and others, are tasty and good for you. They are good sources of vitamins, minerals and antioxidants. Spirulina and Chlorella. These are both types of algae and are rich in protein. They are also able to chelate, or attach, to heavy metals, which means they are good for detoxifying the body. Seaweed. You can consider seaweed the green vegetable of the oceans. Although not quite the same as greens that grow in the earth, seaweed is rich in nutrients and a healthful addition to any green diet. Seaweed has vitamins A and C, calcium, and most importantly, iodine, a trace but important mineral. Watercress. This underrated salad green is an excellent addition to a healthy diet. It has a light peppery taste and is high in important antioxidants like lutein, beta carotene and zeaxanthin. Does the thought of getting all of these greens into your daily diet seem daunting? Whether it’s the trips to the market to track them all down, the flavor of greens that you just can’t stomach, using them before they go bad, or the cost, it’s just not that practical. Green superfood supplements to the rescue! Some of the better green superfood mixes include nearly every green you can think of in a convenient powder that you can add to your smoothies. Some even come in tasty flavors so that you can strategically mix into different recipes to enhance both taste and nutrition. Of all the green superfoods on the market, the three below are my favorite and the only ones I feel comfortable recommending at this time. Boku Superfood. The founders of Boku developed a passion for using foods for healing when their young son was told by doctors that he needed psychotropic medications. Instead of using drugs, they researched foods and supplements and treated him naturally. Now they sell several great products including Boku Superfood, packed with greens and other superfoods. Boku Superfood has over 60 ingredients including barley grass, parsley, kale, spinach, broccoli and cabbage as well as superfood fruits and berries and probiotics. It’s hard to find a food that is more nutrient dense than this one. It is all organic, vegan, soy-free, gluten-free, and non-GMO as well. This is my preferred green superfood. Click here to purchase. HealthForce Vitamineral Green. HealthForce has been making superfood supplements for 20 years. Their products are vegan, organic, and raw. Vitamineral Green is a green superfood powder that is nutrient-dense and includes ingredients like oat grass, basil, parsley, wheat grass, chlorella, spirulina, seaweed, probiotics and more. The formulators at HealthForce have chosen each ingredient in this supplement for maximum nutritional power and therapeutic benefit. Click here to buy. Sun Warrior Ormus Supergreens. The green supplement from Sun Warrior is a powdered mix of several ingredients including spinach, barley grass, wheat grass, oat grass, and alfalfa. It also has peppermint and the natural, calorie-free sweetener stevia, which both create a nice flavor. This is definitely the tastiest greens supplement you’ll find on the market, but you can get the powder without the peppermint and stevia if you prefer something flavorless. This product also includes probiotics, but in a unique way. They are cultured in the greens before creating the powder, rather than being added after. This process means that the helpful probiotics are more bioavailable. The ingredients for Supergreens are grown in a pristine, volcanic valley in Utah and the product is processed in the U.S. Click here to purchase. You can always use whole, raw greens in your smoothie recipes, but with a green superfood powder you get multiple ingredients in one, convenient, nutrient-dense scoop. If you are going to use whole ingredients, check out your local farmer’s market for organic products and for a range of produce with more variety than you are likely to see in your closest supermarket. Your grocery store is a possible source as well. More and more stores are stocking their shelves with a variety of organic produce. Using a green superfood powder is a great way to get a whole range of ingredients, and all the nutrients and health benefits that come with them, with one easy and convenient product. It is important when eating greens for nutrition to use a variety. If you only ever put spinach in your smoothies, you won’t get all of the positive benefits of the other many greens available. A greens powder can give you that variety. The other great thing about a green superfood powder is that you can add a scoop, or whatever measured amount is appropriate for your needs, into any smoothie you make. Not all greens have the best flavor, but they can largely be disguised by the other ingredients you use like fruits, honey, yogurt, cocoa, and flavorful spices. Having a green smoothie for breakfast is a great way to get off on the right foot with all the nutrients you need to have a fantastic day with plenty of energy. Experiment by adding a green superfood to your favorite breakfast smoothie recipes or try this classic. Remember, when you use your green superfood follow the directions for how much to use. Most products will recommend that you start with a teaspoon a day and work your way up to using it in greater quantities. These products are generally considered foods rather than supplements and are safe, but it can be a shock to the system to eat too much right away. Once you have gotten into the daily habit of eating your greens, you will wonder how you ever managed without them. What’s your experience with green superfoods? What’s your favorite green superfood? I’d love to hear your thoughts on the subject – please leave a comment below. Happy Blending! 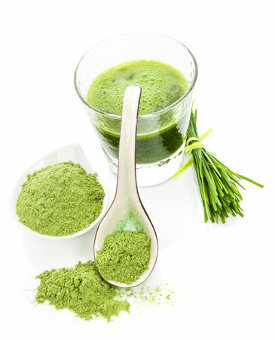 Hi I have IBS and I would like to use a green super food powder so can you recommend one for me. I’d go with Boku Superfood. Hi, great article! Just wondered if you know anything about ‘mega nutrition organic superfood’? In a moment of sheer madness I bought a six month supply and am now wondering as to its efficacy. Any thoughts would be greatly appreciated. Hadn’t heard of mega nutrition organic superfood until just now. I scanned a sales page and it looks legit to me. It’s organic and contains nothing but good stuff. If your body agrees with it I’d say you made a wise purchase. When using chia seeds, flax and/or hemp hearts…is it all right to use all three together or is it redundant? Kale or spinach is one better than the other for smoothies? Good questions, Diane. Yes, you can use all three together as they all offer their own unique health benefits. Most people alternate to save money. I prefer chia myself. Both spinach and kale offer different health benefits so neither is really better. I recommend rotating your greens. Which superfood powder would you recommend diabetics? I would go with the Boku Superfood. I’ve never tried that product, Wayne. However, after a quick look at the ingredients and seeing that it’s organic, I approve. Can a Greens Superfood powder be used instead of the actual greens and get similar nutrition? Hey Ryan, I just blended about 6oz of aloe juice with a blender full of mixed greens to freeze, does that ratio sound okay for daily consumption in a smoothie with fruit…? That sounds like more than enough aloe and greens for daily consumption. Unless you’re going to spread it out into several smoothies. Thanks for the great article Ryan. Indeed, with a green superfood powder, we get multiple ingredients in one, convenient, nutrient-dense scoop. I am using the perennial & turmeric powder in smoothies. I’ve been using many of Dr Cowan’s powders as well – excellent stuff! Thank you very much Ryan for your feedback. Just used cacao nibs for the first time tonight in a smoothie – Wow!